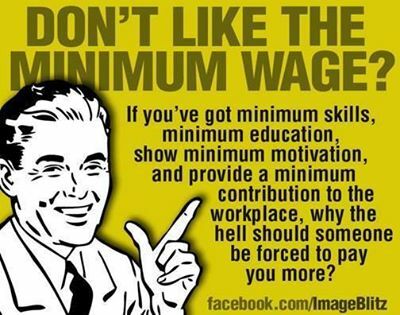 The above posting about “minimum wage” makes more sense than any of the clamoring from the demonstrations of “fast food” and restaurant employees. Additionally, it is consistent with traditional compensation management philosophy. If what you are being paid as a fast food (a misnomer in most cases) worker doesn’t meet your requirements, quit your job and look for another. That is what most people in other occupations are required to do. If you can’t find work paying enough, go to school, learn a trade, or educate yourself in other ways that will improve your skills and lead to more opportunities. Many jobs don’t require advanced education – you need only to apply yourself to the needs of the employer. Don’t wait for others to provide for you. The path forward also applies very much to restaurant workers such as wait staff who have become dependent on tips for the majority of their income. Restaurant owners will tell you that it is to ensure good service. That is nonsense. In most cases, and I have used many restaurants in the United States (US), it is obvious that tips make no difference. This practice pits the workers against the customers to determine their income, relieving the owners from management of their employees. The level of service is pretty much “fixed” at the level of serving the meal and perhaps checking back a couple of times, if you are lucky. If you have a need for additional service you try to get the waiter’s attention and ask for it. The restaurant owner’s assertions are only hiding their exploitation of their employees. If the restaurant is not generating enough income to pay the workers a proper wage, it should go out of business as other businesses do. The market place should determine the survivability of an enterprise. I have had shoe sales people and others spend more time satisfying my needs than the typical waiter. Since many of the so-called minimum (or below minimum) wage workers are also subscribed to the social services (food stamps, EBT cards, subsidized health insurance, subsidized housing, etc. ), the working, tax paying public is subsidizing support of the workers and relieving the establishment owners from paying the actual cost of their labor. This is also true of those enterprise owners that utilize illegal workers who obtain social services paid for by the tax-paying population. Many of these individuals, in all of the above categories, as well as others, have the funds to cover their bodies with tattoos, insert penetrations, booze it up, party, and participate in other non-productive activities, but can’t support themselves. I, as many people feel, don’t even want these people handling my food or serving me. Traditionally compensation management has been conducted through the application of job descriptions and duties. For a particular level of performance the duties were spelled out, along with the level of authority expected to be exercised in performing the duties. In turn, these authorities and duties were tied to a level of pay. In this manner the contribution of the employee was paid at a measured rate of pay. As expected performance levels increased, so did the pay. If the employee did not perform at the level for which he or she was being paid, another job was most likely in order – either voluntary or mandated. Perhaps a change of employer. The idea of employees demanding a minimum wage level is contrary to the principals of capital ownership. This is inherent in the existence of labor unions. An example of the negative impact of unions on public capital exists in the form of unionization of garbage collection workers. Arguments for higher and higher pay, and eventually unionization of the workers, was based on the back-breaking labor involved (they had choices for other employment). However, after unionization most cities where unionization took place probably converted to mechanized pickup (green barrels). But, demands for increases in costs and wages didn’t go away, they just had a different rationalization and justification. It is my opinion, consistent with the opinions of others, the reasons have more to do with the introduction of additional “middle men” of questionable credentials than with valid justifications. The auto industry is another example.